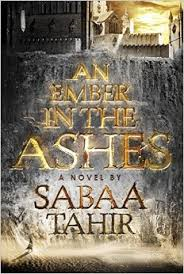 An Ember in the Ashes follows the story of Laia, a slave, and Marcus, a soldier. Both are chained to duty, and both dream of freedom. When Laia’s grandparents are murdered and her brother arrested, Laia must turn to an underground rebel force to save her brother from certain death. They agree to help her, on the condition she becomes a spy in the home of an enemy. Laia’s new mistress is cruel and clever, and Laia soon discovers that she will be lucky if she can escape with her life. Her mistress’ son, Marcus, is being trained as an elite soldier. His mother despises him because he was born out of wedlock and is her greatest shame. Marcus plans his escape from the training compound, but unforeseen events land him in the heart of danger. Laia and Marcus cross paths, and it soon becomes clear that their destinies are intertwined. A rather impressive debut novel, this book leaves the reader both satisfied and wanting more. The open ended conclusion implies that it may turn into a series, but there is no information about whether that will indeed be the case. This book would be great as a movie adaptation, so it will be interesting to see if that will eventually occur. This book has a wonderful balance between romance, action, and intrigue. The romance elements are subtle, and the reader is privy to the convoluted feelings of the characters. Romance is by no means the focus of the novel and acts more as an undercurrent driving the plot. There is a good deal of action throughout the novel and the main characters are often faced with difficult moral dilemmas. The intrigue of the story keeps the reader on the edge of their seat. Although it is clear who the “bad guys” are, the plot itself is not entirely predictable. Reader’s Annotation: A slave and a solider joined by destiny. Both imprisoned by bonds they feel they cannot break. Describe Laia’s feelings when she sees Marcus without a mask for the first time. Talk about fears, and relate them to Marcus’ trials. Justification of Selection: This is an incredibly engaging book that could appeal to both male and female readers. There is both action and romance, and the book is divided pretty evenly between the male and female protagonists. Tahir, S. (2015). An ember in the ashes. NewYork, NY: Razorbill.